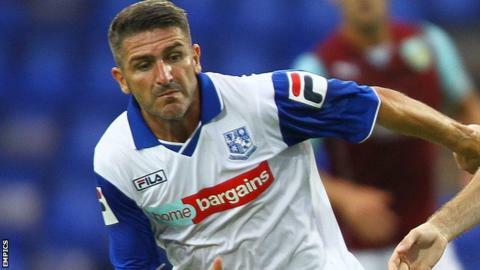 Striker Ryan Lowe says Tranmere were spurred to victory at Colchester on Saturday by being forced to play in the away strip of their opponents. Referee Andy Davies refused Rovers, who won 2-1 in Essex, permission to use their sky blue second kit. "When you walk in and you have to wear their away kit, it's a kick in the teeth," Lowe told BBC Radio Merseyside. "It affected me early on, but I went to the loo, got my head down and thought 'let's beat them in their own kit'." He continued: "It's one of those things that happens and we were just made up to get the three points however it came, whether we had to wear a different kit or skins or whatever it was going to be. We needed to take three points." Victory kept Tranmere out of the League One relegation zone on goal difference. Lowe, 35, was captain in the absence of injured skipper James Wallace and netted the winner - his 20th goal of the season. "It's nice because you have targets and they're what you go for," added Lowe, who joined from MK Dons at the start of the campaign. "Being ultra critical, I probably could have been on 30 because of the chances I've had and missed. But it's about the team and if I can keep scoring, hopefully it will help the team out."